Bromsgrove & Redditch Athletic Club runners Paul Collins, Ian Nutter, Ian Keyte, Phil Richardson, Kevin Lanckham and Kevin Fisher posing with the new club mascot. 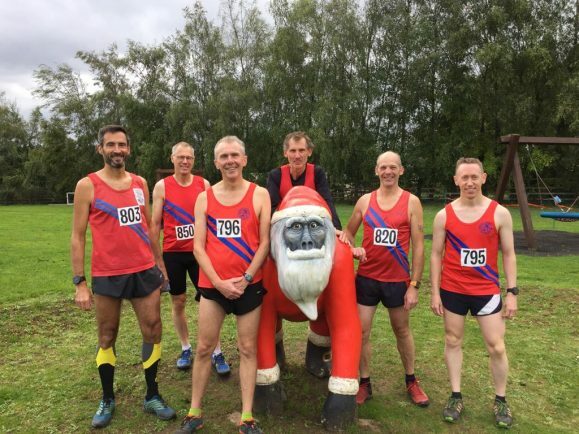 KEVIN FISHER led the way for Bromsgrove & Redditch Athletic Club with 55th place in the first of four races in the Gloucestershire Cross Country League on Saturday. There were half a dozen B&R runners in action in the cross country season-opener and between them they had a combined age of more than 320. Old Down Country Park in Thornbury, near Bristol, was hosting a race for the first time, courtesy of Stroud AC and more than 200 runners lined up on the start line on an unseasonably hot day with spectacular views over the Severn Estuary for the hilly, 4.5-lap course. Fisher – the only B&R runner aged under 50 – started well and maintained a good pace to finish 55th, followed by cross country specialist Kevin Lanckham in 77th. Paul Collins – returning to racing after a foot operation – managed to overcome early race stiffness to catch a tiring Ian Keyte in the final half mile and they finished 105th and 112th respectively. Phil Richardson in 150th and Ian Nutter in 167th completed the scoring six to give B&R ninth position in the masters category.